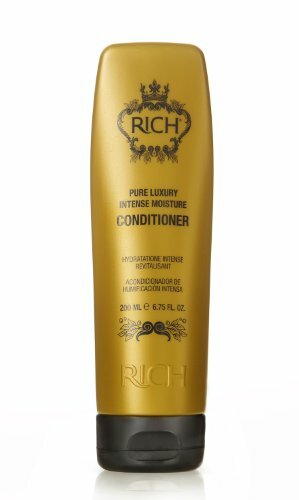 RICH Pure Luxury Intense Moisture Conditioner 6.75oz - Luxury Beauty Care Products ! A luxurious daily conditioner that injects moisture into the hair whilst calming static. Its lightweight formula delivers intense conditioning qualities without weighing down even the finest of hair. A micro-emulsion of Protein & Vitamins are quickly absorbed into the hair and prevents product build-up. Hair is effortlessly detangled whilst your scalp is nourished. Color protective and leaves distressed, dry, damaged hair feeling softer, shiner and more manageable. Includes UV filters.A luxurious daily conditioner that injects moisture into the hair whilst calming static.